At Wednesday's meeting of the President's Council of the Interfraternity Council, sweeping changes were approved to the alcohol policies that govern parties held in fraternities, sororities, and independent living groups. The new policy, produced by the Committee on Social Policy, Liability and Risk Management affects the way FSILGs deal with alcohol at events and mandates that all new member events be alcohol free. It is designed to "provide a safe environment at MIT� where we could allow people over 21 to drink," said John M. Bustamante '99, chairman of the committee which was made up of eight undergraduate presidents and four IFC alumni. 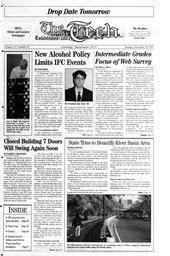 Iddo Gilon '98, president of the IFC, said that these changes "permit the atmosphere for responsible drinking." We "don't need to micromanage because we can't," Gilon said. The committee's proposals, besides requiring that all new member events be alcohol-free, require that all FSILGs have a risk management chair and safety officer, that members of the IFC with MITapproved housing status may not have a tap system and kegs present in their house, and that no alcoholic beverages may be purchased through a living group's treasury. The policy also changes the penalties for violations. The policy introduces a new set of guidelines governing events with alcohol. All FSILGs wishing to hold events with alcohol must now be certified by the IFC for alcohol use. Bustamante said that the exact details of certification were still being "hammered out" but said that the process should be in place by the spring. Certification will involve TIPS and CPR training, Bustamante said. "The temporary ban [on alcohol at FSILG events] is still in place until certification is up and working," Bustamante said. Events involving alcohol at FSILGs must now either be designated as bring your own beer events or third party vendors must serve the alcohol. Additionally, "party monitors" must now be present at all alcohol parties. Party monitors must be 21 years old, not undergraduates, and may not be affiliated with the FSILG unless the number of people at the event is less than or equal to the number of people in the house. In that case, graduates or alumni of the house can serve as monitors. Party monitors will provide "a great deal more oversight than just the IFC executive committee and [judicial committee]," Bustamante said. The monitors are "the eyes and ears of the IFC." It is hoped that the party monitors will be drawn from the graduate population of the Institute, Bustamante said. Still, the IFC is "not sure it's going to work." Gilon said that the ability to use alumni at small events will likely lead to a decrease in the size of events. The regulations regarding BYOB parties allow guests 21 years and older to check up to six 12 oz. containers of beer or wine coolers at the door. Hard liquor may not be brought to the party. Guests will receive a card that may later be exchanged for as many drinks as were checked. "BYOB is the more promising option," Bustamante said. Bustamante said that he hoped that a single third party vendor would be contracted which would be approved for all IFC events, should houses choose to have events of that type. The policy was approved with 21 members in favor, 9 opposed, and 8 abstentions. There has been "a lot of opposition" to the changes, Gilon said. This represents "a real challenge to leadership that will develop in the ILGs." Those "individuals who are more informed� are more ready to accept these changes." The new risk management chair will have responsibilities "broader than just parties," Bustamante said. The risk management and safety officer should "create and enforce a risk management policy for their living group," according to the committee's report. Tapping systems "fostered a sense of alcohol culture" according to Bustamante. The systems were also a liability since "everyone who is under 21 has access to alcohol." Banning tapping systems would "decrease liability by decreasing accessibility," Gilon said. When "75 percent [of house members] are underage, why should alcohol be available?" Tapping systems are already prohibited in Boston living groups by the Boston Licensing Board. Banning the use of house funds to purchase alcohol "reduces the house's liability," Bustamante said. This change was borrowed from the Fraternal Insurance Purchasing Group policies, a series of insurance guidelines to which many houses are bound for insurance purposes. The committee borrowed from these guidelines but the IFC is developing "a policy that would work for us." Penalties for violations of IFC policy will now be based on a "three strike" system. IFCmembers will lose their certification and their alcohol privileges at events for 120 days upon a first violation. After a second violation, the offending FSILG will be required to be alcohol free for 120 days. If a living group violates the policy three times they will lose freshmen approved housing status for the following year. We "didn't feel that [the existing sanctions] were appropriate any longer" Bustamante said.Current penalties, all monetary, are as small as 50 dollars. The new penalties are "more of an educational process," since they require recertification and contact with the IFC. The penalties will "make sure [the offending FSILGs] are able to have events with alcohol again," he said. Juliet C. Midgley '98, a member of the committee, called the three strikes policy "a step in the right direction."